The 2019 session will take place from June 1 through July 27. The Alfred and Trafford Klots International Program for Artists provides time for uninterrupted work in an inspiring and historic setting made unique by Brittany's extraordinary light, distinctive landscape, and rich cultural traditions. The program awards successful applicants with free housing and studio space in the village of Léhon. Residents are responsible for most meals and incidental expenses. MICA charges no fees for application to or participation in the Alfred and Trafford Klots International Program for Artists. The selection committee and program directors seek four to eight artists whose mix of media, approaches, styles, and focus will create a dynamic and collegial community. In particular, we are looking for artists who can use the specific character of our residency experience productively. The setting is perfect, for example, for plein aire painters who will profit from their interaction with the light and landscape, but we encourage artists working in all media to submit applications that demonstrate how our residency will significantly enhance and strengthen their practice. The Residency is open to all practicing visual artists regardless of affiliation or citizenship who are not students at the time of application. 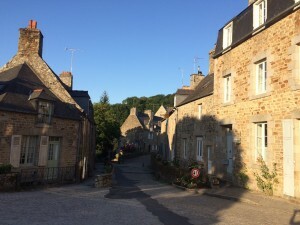 The village of Léhon, which grew up at the site of a strategic ford used by the Romans, bears the coveted distinction "Petite Cité de Caractère" and is graced by a medieval abbey and its gardens and guarded by the ruins of the oldest fortress in Brittany, which was depicted in the Bayeux Tapestry. Léhon has all of the important amenities of a French village (a café, a restaurant, a bakery) as well as Brittany's only heated outdoor public swimming pool. The village is a 20-minute leisurely walk to Dinan, itself a "Cité d'Art et d'Histoire." Dinan is a spectacular ancient walled town close to Dinard, St. Malo, Mont Saint Michel, and Rennes. The beaches and fishing villages of the Emerald Coast are approximately 30 miles away. The atmosphere at the MICA residency program and the town of Léhon where it takes place are captivating and inspiring. Of course, there are the visuals: the glut of shapes, colors and light that are constantly surprising. The sensation of the forms entwine with their history. We couldn't come to the end of the possibilities presented by the abbey with its legends, a secret passage, a ghost story, a secret garden by the water with woven fences and pear trees, and the attic: a dark, safe visual totality often accompanied by the voices from choral practice down below. The cloister, the streets of the town, the bridge reflected in the water down by the place where we stayed gave us infinite combinations of light and atmosphere. The Bretons let us know each day how much they appreciated us and our work. An invitation for a glass of wine and enormous patience with our language skills seemed to go with every encounter. The most important element was perhaps the way the group of painters and our kind and deeply generous directors created a dynamic context, which came together for everyone in the conversations at the exhibition. Shared ideas and shared experiences such as how to keep warm on cool mornings, improvised French study groups and exercise classes, expeditions to find menhirs [Paleolithic standing stones] and Roman ruins created memories that continue to sustain us. The Abbye is a haven of enchantment. We are smitten. Coming into the Abbaye, you pass through a cloistered courtyard where shiny green boxes of geraniums perch along the inner walls. 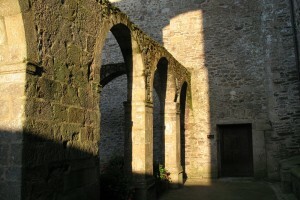 The light plays over the surfaces, around the sculpted forms, and through the arches; the stones change color, warm to cool; lines and planes disappear and reemerge; someone is playing Chopin on a piano. Within the walls is a Pisarro-like garden, beyond the garden the River Rance. I painted the giant orange-red poppies in front of the church, aflame in the misty atmosphere, and later as the sun came out I did a quick painting of the cloister. At the Abbaye everything is well loved and well tended. The flower display is fabulous. Flowers, birds, smells, stillness, light, levitation-in the Abbaye, LIFE is cherished. Even the footpath from Léhon to Dinan is lined with beautiful places that overlook terraced vegetable gardens, little orchards, and magical children's hideaways. At one point, the levels seem to go down and down, under a canopy of fruiting and flowering trees. The opportunity in France to be open, receptive but also really think about where my art is and where it is going and the influence of place on what I create, was one of the most important things to have happened to me in many years-in my career and otherwise. I just wanted to let you know that it was a very multi-dimensional experience, filled with sensations, thoughts and of course friends, and I am very grateful. My summer painting in Léhon was a magical experience. I didn't anticipate how the beauty of Bretagne, the quiet of the abbey, and the diversity of my group would challenge me to develop and grow as an artist. I'm currently working on a new body of work, which would not exist if not for my time in Léhon. The Residency was a creatively validating and enriching experience, and the time working in the historic Abbey was magnificent. The creative energy generated by the other talented artists in the Residency gave me new ideas and techniques to add to my own work. The entire experience was more than I could have hoped for and my growth during and after my time there has given my career a boost at a perfect time. 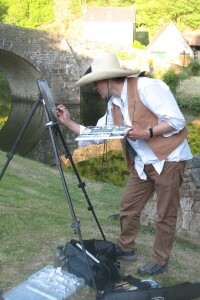 Before my experience in France, I painted for two-month long self-guided plein air "residencies" in Vietnam. Painting in France allowed me to research three key movements: French Indochina, French East India trading with Vietnam, and the French Foreign Missions Society. Serendipitously, I searched out rococo interiors near Léhon. The interiors I painted in Malouiniere's were owned by the St. Malo merchants of the 18th century. I continue to paint and make larger work thanks to my experience in Léhon. I am expanding my subject to reflect upon the colonialism (missionaries, merchants, governing bodies) that resulted (eventually) in the American Vietnam War. The experience was a truly wonderful mediation on the glorious ability to paint from life with inspiration coming solely from what I saw, the paints I carried with me, the company of fellow artists (and hosts Christopher and Jane Shipley), and my past study which rests in my mind. The residency invigorated my belief in the strengths of pure visual communication. In 1989, Isabel Klots founded the International Program for Artists in Rochefort-en-Terre in memory of her father-in-law, Alfred Klots, and her husband, Trafford Klots, both artists, and of their hospitality to other artists. In 1995, Maryland Institute College of Art began administering the program.